Here is our latest fundraiser. And we believe you will enjoy this very much. How often do you get an opportunity to purchase beautiful greeting cards featuring Great Pyrs? Doesn't happen often. But we have them. 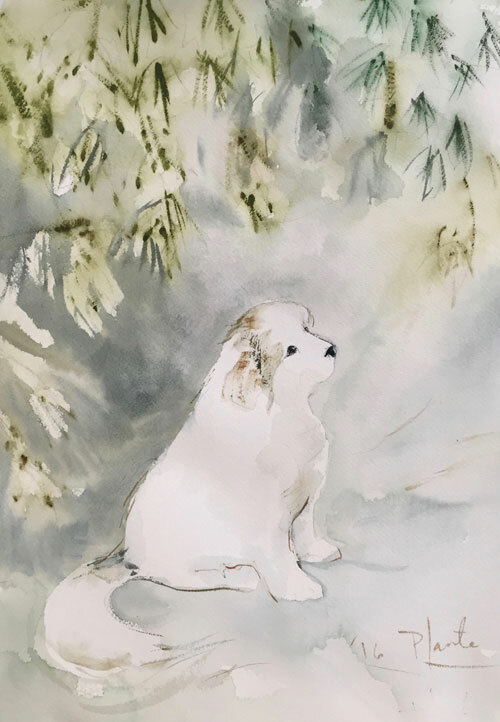 Yes, we have a limited supply of beautiful greeting cards featuring a Great Pyr. These were painted and generously donated by Kay Plante. Kay has titled this piece 'Wintergreen and White'. We believe it's a perfect title for this beautiful creation of hers. This card is a faithful reproduction of the beautifully rendered watercolor original. Kay has provided us with a limited number of sets of these as a means to raise funds for our rescue efforts. We are very grateful to her for her love of the breed and support or our club. This is the second time Kay has done this for the club. Her last cards sold out quickly. Many people missed out. If you delay you will lose out on the December 2016 edition. So now... what about you? This is a rare opportunity to claim a set of these beautiful cards as well as support our club's rescue of Great Pyrs. Each set contains 5 folded cards. The cards are 4.5 inches by 6 inches and come with envelopes. These are beautiful cards that you will cherish forever. Or even better you will be able to share them with other Great Pyr lovers. So how do you get your set? Simple. Just provide your contact information below so we can mail them to you. Then make a donation to the club using the Donate Button located in the Top Left Corner of every page. We are asking for a minimum donation of $12 for 5 cards. Of course we would be delighted if you were to donate more. Every penny that we raise goes to support our Great Pyr rescue efforts. This is a very limited edition run of these cards. These will not last long. Don't be disappointed. Act now. While you're here... why not share this page with your friends? You''de be helping us by spreading the word.